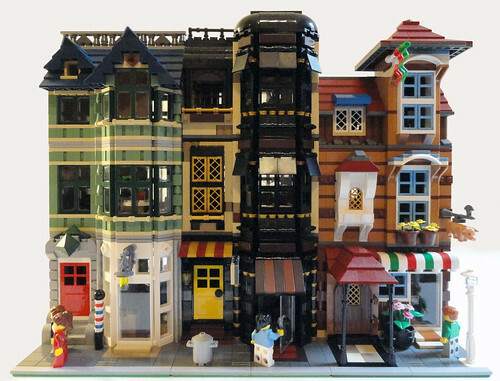 Brick Town Talk: Meet the New Guy - LEGO Town, Architecture, Building Tips, Inspiration Ideas, and more! My name is Jonathan, and I am excited to have been selected by Chris to be the newest author here on Brick Town Talk! I have been fortunate enough to have been featured on the site several times in the past, most recently with my Galaxy Diner and Empire Theater, and those of you who frequent Flickr or post on the Eurobricks forums might know me better by my screen name, sonicstarlight. I came out of my Lego dark ages around the time the Cafe Corner hit the shelves, and I was instantly in love with the modular line. In addition to all the official releases, I currently have 7 MOCs of my own. I am a purist at heart (technic bricks and pins to join models together, detachable floors, no stickers), and I try to make buildings that work in harmony with the official sets while still being unique. Seeing all the great creations by others on this site truly served as the inspiration for me to start making my own models, and I promise to do my very best to find and share the best buildings out there with all of you. I know that no one visits this site to read a novel, so I'll stop writing now and end with a photo of my latest CC-standard creations inspired by The Burrow and Diagon Alley sets. And I promise that going forward, my posts won't all be about me. a castle alike!! love it, looking really so well and realistic!